Maybe your kid is starting music lessons, or maybe you are trying to learn a new hobby yourself. If you are looking for a musical instrument of any kind, there are plenty of places to purchase one in the Dallas/Fort Worth area. To help you out, we’ve compiled a list of places to check out as you search for the perfect instrument. Guitar Center is a great go-to. It has several locations around the DFW metroplex and has a great variety of instruments. If you are looking for something specific, you will most likely find what you need there. You can try out instruments in the store if you are still trying to make a decision. The staff at Guitar Center will help you in any way they can, so feel free to ask questions! If you are looking for a budget-friendly music store, you should definitely check out Music Go Round! They buy used instruments and music equipment and sell them to other musicians at a fair price. You never know, they might have exactly what you’ve been looking for. Got a drummer in the family? Get them the right supplies at Lone Star Percussion! This store has tons of drums and drumming equipment - all within a good price range. Stop by their Dallas location or check out their website to see what they’re all about! 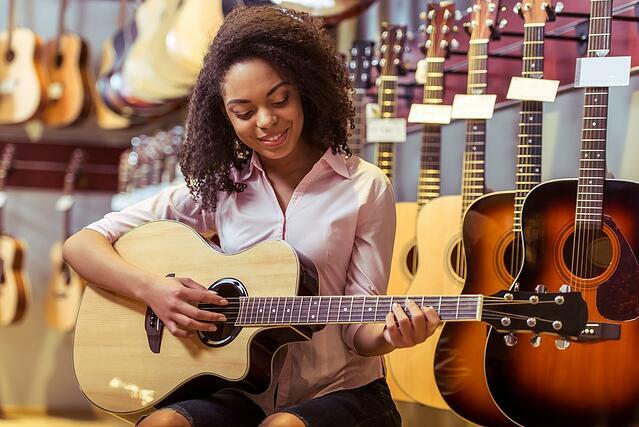 While you may not be prepared to buy an instrument, you can certainly rent one until you are! At Young Musicians Rentals & Repairs, you can find classical string instruments to rent at a fair price. Your kids can learn how to play with a rented instrument and decide if they love it enough to buy one of their own. Is it the right instrument for your kid (or you)? Have you considered the noise implications? Is it good quality (does it have any structural weaknesses)? Do you have a place to keep it? We hope this is helpful as you look for the perfect instrument! Have you been to any of the places above? Which one do you want to check out in the future? Let us know in the comments below!